This weekend the K League Classic moves onto it’s fourth round of the 2015 season. A few sides have started the season well whilst others haven’t done quite so well. As mentioned last round this year there also won’t be able long breaks during the season so from now until November the K League will take center stage. The league table is still developing as only 3 games have been played so far. Three sides Ulsan, Gwangju and Jeonbuk are all tied at the top with 7 points apiece. At the other end both FC Seoul and Daejeon have failed to pick up any points so far this season. However there is still a long way to go. Saturdays first 2pm game features 11th placed FC Seoul and 6th placed Jeju United. FC Seoul have lost all three of their games this season and sit down in 11th. Park Cho-Young should be involved which will bring in the fans. Jeju United drew their first 2 games but hammered Daejeon 2 weeks ago 5-0. Although Seoul have been poor so far this season we see them improving, and with Jeju weaker away from home we see this as a draw. Saturdays 2nd 2pm game is between Suwon Bluewings and Busan I’Park. Suwon Bluewings have bounced back from their opening day defeat by winning their last 2 games. Busan I’Park have 4 points from their opening 3 games, but looked sloppy last time out vs. Gwangju. Suwon Bluewings will be favorites at home. Saturdays 3rd 2pm game features the 2 K League giants in Jeonbuk Hyundai and Pohang Steelers. Jeonbuk Hyundai are currently 3rd with a solid record of 2 wins and 1 draw from their 3 games. Pohang Steelers have recorded 2 wins (over Seoul and Suwon) and 1 defeat so far. This one looks like it will be an entertaining game, but overall we see a draw. Saturdays late game features 2 sides still looking for a first win of the season with Daejeon Citizen hosting Seongnam FC. Daejeon Citizen have lost all three of their games so far this season, and have also failed to score. Seongnam FC have picked up just 1 point from their 3 games so far this season, however they’ve fared better in the Asian Champions League. This one will be tight, but we see Seongnam edging it. 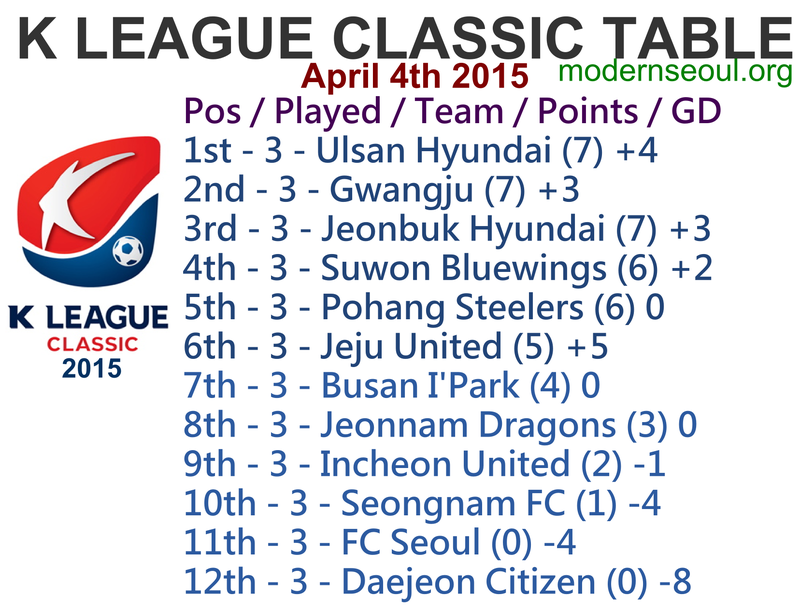 Sundays second game features the current top 2, leaders Ulsan Hyundai host 2nd placed Gwangju. Ulsan Hyundai have looked strong in each of their games so far this season picking up 7 points so far. Gwangju are the shock side so far this season, they’ve also picked up 7 points from 3 games. Ulsan will be favorites, but Gwangju will give them a close game. Sundays late game features 2 sides towards to the bottom of the table, Jeonnam Dragons and Incheon United. Jeonnam Dragons have drawn all 3 of their games so far and have only conceded 1 goal and scored 1 goal all season. Incheon United have drawn twice this season, but looked better in their last game vs. Jeonbuk. This will be a close game which either side could edge, but we this as a draw. All three of the 2pm kick offs were close with each of the home sides winning but just a single goal. All 3 games also attracted healthy attendances (all 10,000+). However only around 1,500 turned up to see Daejeon beaten once again, but they at least scored for the first time this season. Ulsan contained their strong start to the start with a comfortable victory over Gwangju. Jeonnam Dragons held on to claim their first win of the season, beating Incheon United. 3 correct results but no perfect scores (same as last week). The K League Challenge season continues this weekend, here is the K League Challenge 2015 Round 3 Preview, Predictions and Results.